Submissions open September 1st for the annual The Journal/Charles B. Wheeler Poetry Prize. Each year, manuscripts by emerging and established poets are screened, in accordance with CLMP guidelines, by volunteer readers associated with The Journal and The Ohio State University English Department. Associate Poetry Editor of The Ohio State University Press, Pablo Tanguay, selects semi-finalists and Kathy Fagan, Series Poetry Editor, selects one full-length manuscript for publication by Mad River Books, the trade imprint of The Ohio State University Press. In addition to publication under a standard book contract, the winning author receives the Charles B. Wheeler prize of $2,500. Entries of at least 48 typed pages of original poetry must be submitted electronically during the month of September. The submitter’s name or other identifying information should appear only on a separate cover page and not within the document. All manuscripts will be read and judged anonymously. Manuscripts must be previously unpublished. Some or all of the poems in the collection may have appeared in periodicals, chapbooks, or anthologies, but these must be identified in an acknowledgments page. A nonrefundable handling fee of $28.00 will be charged for each entry. All entrants receive a one-year subscription to The Journal. The winning entry will be announced in January. Kathy Fagan’s fifth collection of poetry, Sycamore (2017) is available from Milkweed Editions. Her previous collections include Lip (Eastern Washington University Press, 2009); The Charm (Zoo Press, 2002); Moving & St. Rage (University of North Texas Press, 1999), winner of the 1998 Vassar Miller Prize for Poetry; and The Raft (Dutton Press, 1985), winner of the National Poetry Series. Fagan is the recipient of fellowships from the Ingram Merrill Foundation, the National Endowment for the Arts, and the Ohio Arts Council. She is currently a professor of English and Director of the MFA in Creative Writing at The Ohio State University, poetry editor of OSU Press, and advisor to The Journal. BK Fischer is the author of two books of poetry, Mutiny Gallery, winner of the 2011 T. S. Eliot Prize from Truman State, and St. Rage’s Vault, which received the 2012 Washington Prize from The Word Works. My Lover’s Discourse, a gurlesque remix of Roland Barthes, is due out from Tinderbox Editions in late 2017. Her poems have appeared in The Paris Review, FIELD, Ninth Letter, Literary Mama, WSQ, Blackbird, and other journals, and are forthcoming in Kenyon Review. Also the author of a critical study, Museum Mediations: Reframing Ekphrasis in Contemporary American Poetry, she teaches the Comma Sutra at Columbia University and is a poetry editor at Boston Review. Rosalie Moffett of Athens, Georgia, won the 2015 The Journal Charles B. Wheeler Poetry Prize for her collection June in Eden, selected by Marcus Jackson. She will receive $2,500, and her book will be published by Mad River Books, an imprint of The Ohio State University Press, in 2016. The annual award is given for a poetry collection. Moffett is a former Wallace Stegner Fellow and received her MFA from Purdue University. She is the winner of the “Discovery”/Boston Review prize and the Ploughshares Emerging Writer Prize. Moffett’s work has received support from the Tin House Summer Writers Workshop and Bread Loaf Writers’ Conference. She has poems in or forthcoming in AGNI, The Believer, FIELD Magazine, The Kenyon Review and Tin House, among others. She teaches creative writing online and lives in Athens, Georgia. The Journal is excited to announce that the winner of the 2014 Wheeler Prize in Poetry is Talvikki Ansel for her third collection of poems, Somewhere in Space, due out this fall with The Ohio State University Press. 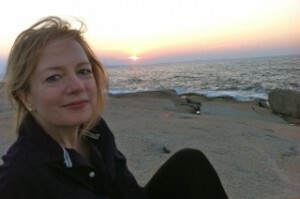 She is the author of the Yale Younger Poets selection, My Shining Archipelago, and Jetty and Other Poems. A former Stegner fellow and recipient of a residency from the Lannan Foundation, Ansel has published widely in venues such as Poetry, Blackbird, The Atlantic, and The New Republic. She lives in Rhode Island. More than 550 manuscripts were submitted for this year’s competition, and we would like to thank everyone who participated. The quality of submissions was extremely high, and the screeners worked hard and with considerable pleasure. Kathy Fagan was the final judge. Corey Van Landingham was selected as the 2013 winner of The Charles B. Wheeler Prize for her poetry collection, Antidote. Corey Van Landingham completed her MFA at Purdue University, where she was a Poetry Editor for Sycamore Review. She was the recipient of a 2012 AWP Intro Journals Award, as well as scholarships from the Bread Loaf Writers’ Conference. Her poems have appeared or are forthcoming in AGNI, Best New Poets 2012, Blackbird, Colorado Review, Crazyhorse, Indiana Review, Kenyon Review, The Southern Review, Third Coast, and elsewhere. Antidote is the 26th volume of exceptional poetry to be selected for publication by a readers’ committee of OSU poets on behalf of The Ohio State University Press and The Journal, the literary magazine of The Ohio State University. In addition to publication, the award carries with it a cash prize, thanks to the generosity of the family of the late Charles B. Wheeler, Professor Emeritus of the English Department.